Today is a day within the rambutan fruiting season. 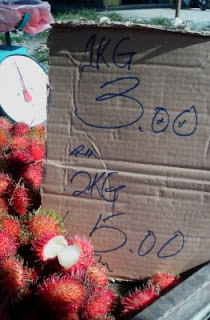 When I went to Bintulu town, there were red and yellow rambutans by the baskets and van loads. From November to February every year, the rambutans without fail show themselves on trees. 'Rambut ' in Malay means hairs and the name rambutan refers to the mass of hairs ( .5-2cm) stuck on the skin of the rambutan fruit. The rambutans are oval in shape and in some varieties the oval shaped could be slightly enlongated. The unripe fruit is green and sour. 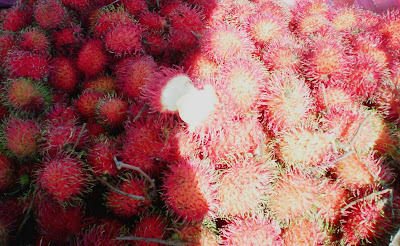 When ripe the rambutans' flesh or pulp are very sweet especially the hybrid ones. To eat the ripe rambutan, remove the skin by a slight twisting movement of hand, then bite into the flesh or pulp and soon the fleshy pulp is peeled off from the seed. In Borneo there are at least 25 species of the rambutans. The trees flower up to 300 ft above sea level. Thus on higher altitudes rambutan don't bear fruit. Rambutans , like the 'mata kuching', 'lici' and 'pulasan' belongs to the genus nephelium. In Greek 'nephelion' means 'little cloud' refering to the delicious pulp surrounding the seeds of these fruits. The peeled flesh are now canned and in some cases are mixed with pineapples for added appeal and taste. By the way in one sitting you can eat as many rambutans as you can.